...I continue to discover unexplored areas of my own heart. Lovely to discover piece of ourselves. Laura you make this flower more beautiful in black and white. Happy weekend! It is always wonderful discovering the treasures within! Lovely photo! A journey without end filled with wonderful surprises. Well, another one of those God's signs. enjoy your weekend of love at home, laura! Very nice heart shaped flower! Perfect in B&W! Have you ever visited Wanda's blog Moments of Mine? She also continually discovers beautiful hearts in nature...if you don't know her blog, I suggest you go right over! You will be transported by all the beauty she shares and her lovely words are so inspiring and uplifting. Lovely photo! I can see how it would be very inspiring! With photography, there is always something new to discover. Limitless opportunities for learning and growth. I find it amazing. Nice capture. Happy "seeing" to you. Hope you have a grand weekend. 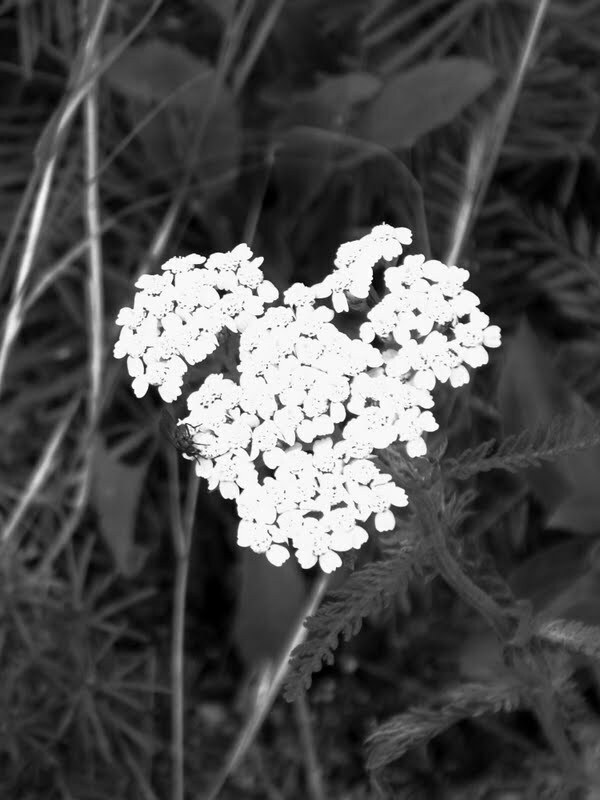 This is a beautiful heart of yarrow, and I also see an insect partaking of its sweetness! Nice image, Laura! That's lovely heart shaped yarrow, at least I think it's yarrow. An ongoing process of discovery ... you saw it well! Loving the black and white, loving the heart, loving the words. Wonderful photo and a very nice statement. Beautiful. this is beautiful Laura. happy day to you. Beautiful Laura. A heart made of white lace!